I had some fun trying to get Text FlowField to show on NAV 2016 Activity page. Per NAV documentation, Cues are supposed to support Integer, Decimal and Text fields as of NAV 2015. Funny thing is, there are no examples of Text fields on standard NAV cues in 2016. Not a single one. So when I tried to add one, I got a very useless stack image with count of 0 and text field title. Fast forward an hour or so of trying various things. The trick is to add the Text field OUTSIDE of CueGroup. It needs to be at the same level as CueGroup, otherwise NAV assumes it needs to show as Stack which is a bit useless. NB: This is a rewritten version of earlier article. The above is what I wrote before I went on leave. Funnily enough, after getting back from my leave I ran into an issue that directly relates and which made me rewrite this blog post. SETFILTER will, in most cases, be able to replicate SETRANGE functionality. In first case, txtFilter will be parsed as filter text. This will cause runtime errors if txtFilter contains something like “(” character. In second case filter will be applied without parsing it. This replicates SETRANGE functionality, or using filter ‘txtFilter’ in filtering dialog in user interface. Remember the last post? I needed a way to easily view and edit large chunks of text, and used Memo BLOBs for that. What I was actually after was a way to display NAV objects in text format in RTC. While the Memo trick worked up to a point, it didn’t play nicely with the long lines of code found in NAV objects, and multi-line textbox doesn’t let you scroll horizontally. While trying to come up with a way to solve this, I had to do some debugging for something unrelated. I looked at the way Code Viewer control was used in standard NAV debugger. For reference, take a look at pages 9500 and 9504 in NAV 2015. Having done this, I had a thought – where exactly does NAV debugger get NAV code from when it needs to display it? The answer was pretty simple, actually – there is a BLOB field in Object Metadata table called “User AL Code”. There is a function GetReport in Codeunits 82 & 92 (it is still there in NAV 2015, and has been there at least from NAV 2009) and it decides which report gets printed. You would think it is intended to be available from anywhere in NAV, but you would be wrong. The catch is in variable SalesHeader/PurchHeader, where same name was used both for parameter of the function, as well as for a Global variable. When function is called from CU82/92, it works fine (as it references the Global variable). Try calling it from elsewhere, and you get <Uninitialized> on the variable in All pane. Try looking in Locals, and there it is again, but this time it contains data. Unfortunately, the Global variable takes precedence and the parameter gets ignored…. No, not for speed, rather for lots of text. I needed to display a lot of editable text in user-friendly way on a card page. That seemed like a good place to start, and led to me writing this post. Add a field to the page and bind it to the text constant. Set the Multiline property to TRUE. Use FIELDNO function on the BLOB field to get intFieldNo parameter. Text variable is used for ptxtTextField. 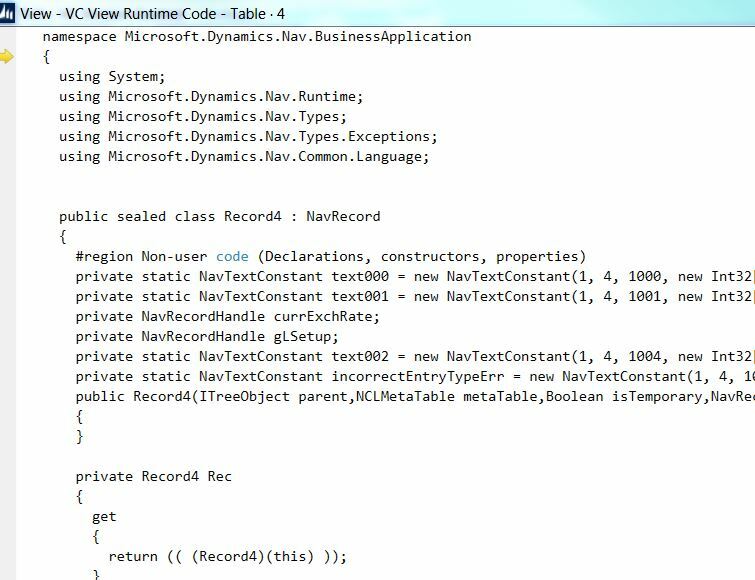 In the last 2 days I have made some interesting discoveries on how Microsoft implemented CaptionClass in NAV2009R2 RTC on Dimension fields. It appears that the caption for page fields related to Dimensions was not using the actual caption from the page or field, even though CaptionClass property was blank. To check for yourself, you will need an out-of-the box deployment of NAV2009R2 (build 32012) and some minor development. Leave CaptionClass property empty, and customize the captions on field and page to two different values. Make sure the field Code Caption on Dimension table is filled in. Run the page. The caption on the page will be drawn from Code Caption on the Dimension table, even though CaptionClass is not used. To test this, delete Code Caption from the Dimension table. You will also need to restart NAV RTC client. Run the page again, and the captions will be empty. This behaviour has changed somewhere between 32012 and build 37104 for NAV2009R2 – now it seems to require CaptionClass to be defined on the table field to display anything, otherwise the caption is blank. Either way, it does not conform to expected behaviour of CaptionClass property. After 13 years in MS Dynamics NAV world, I got to think I should be sharing the (more or less) interesting things I discover in my daily work with a wider audience. To get things started, here is a little something I discovered last week. Looking at online help, it says that too: When a form is run modally, no input (keyboard or mouse click) can occur except to objects on the modal form. Unfortunately, this does not work like that for NAV 2009 Classic (and possibly for versions back to 4.0). Run NAV, navigate to that form, and click your function. Then click any menuitem on MenuSuite, and continue happily working in NAV with “MODAL” form in the background….